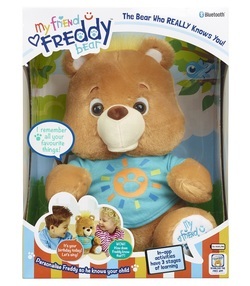 tMy Friend Freddy Bear is a lovely, cuddly bear for pre-schoolers with a difference! He can talk about things which his best friend (your child) is interested in, their friends and family, read stories, and play games. ​All this is possible using the free app which can be downloaded to compatible phones and tablets from the Apple App Store and Google Play. Freddy is the bear who REALLY knows you! Simply type in 50 questions about the child (you don’t need to answer them all). Freddy will then incorporate these details into the things he says. Little ones will be amazed that their bear knows all about them. There is also an ‘Album’ page for entering any information about friend and family, which Freddy Bear will also incorporate into his conversation. They can also record their own messages for Freddy to repeat. All this can be done without even taking Freddy Bear home. (N.B. Only the Settings area of the app can be accessed without pairing with Freddy Bear – the stories and games will be unavailable.) No information is ever fed back to or collected by the app publisher. The tablet or phone can be moved away from Freddy Bear while he is talking, so it doesn't have to be left with the child. Freddy Bear has three types of activities. These encourage letter, number and colour recognition and development of fine motor skills. There are three levels of difficulty for the activities which can be adjusted as the child advances. There are three interactive picture books within the app. There are hidden surprises on each page to explore, and text can be toggles on/off for older children. The app also includes seven audio-only stories to listen to – great for bedtime. Freddy Bear is lovely and cuddly, with very soft fur. When he’s not connected to a smart device he will still talk when he’s cuddled, tipped upside down or thrown in the air. Plus, he has and on/off switch so he can be taken to bed. Batteries - 3 AA batteries required.